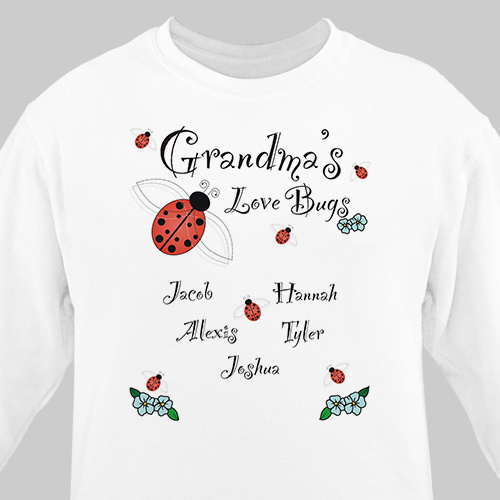 Grandma's grandchildren & Mom's children are sure to look great listed on this bright & colorful Personalized Love Bugs Sweatshirt. She is sure to love one of these attractive & warm Personalized Grandma Shirts on Mother's Day, Grandparents Day, Valentine's Day or on her Birthday. Your Personalized Grandma Shirt is available on our premium white cotton/poly blend Sweatshirt , machine washable in adult sizes M-3XL. Includes FREE Personalization! Personalize your Love Bugs Sweatshirt with any title and up to 30 names. Loved the Love Bugs Sweatshirt. Have several of the Mamie's sweatshirts and various sayings.